First Lieutenant Charles Goffin was born in the village of Graide, Belgium on 7 March 1913. His father was Arthur Emile Goffin and his mother was Pauline Degrez. He had a younger brother Léon, who died tragically in a traffic accident in 1939, while riding Charles' motorcycle. Charles went to elementary school in his native village of Graide. He attended the secondary school of the Monks of Carlsbourg, and then the community school of Carlsbourg. He was an excellent student who excelled in mathematics, and graduated with his diploma in 1932. In November 1932, he entered the Royal Belgian Military Academy, where he again excelled in his studies. He graduated and was commissioned a Second Lieutenant in the Belgian Cavalry. However, Charles' heart was in aviation. One month later, he was transferred to the Military Observation School in Evere (L'Ecole de l'Observation), where he learned to become an aerial observer. He received a special recognition from the Belgian Military Cartographic Institute for his work for the service. He then applied for and was sent to the pilot's school of Wevelgem. Upon graduation, he was promoted to First Lieutenant and was assigned to the Second Group of the Second Fighter Air Regiment of the Belgian Air Force. It appears that Charles had an innate ability to fly. He loved aerial acrobatics, skimming low over and between buildings, and making dramatic loops and figure eights high in the sky above. In fact, he was soon made the chief of the Belgian Air Force's Aerial Acrobatics Team. When the Nazi invasion of Belgium came in May 1940, his unit was flying Fiat CR 42s, which by that point in aviation history were obsolete biplanes. However, Charles was too good of a pilot to let his airplane hinder his performance. On 10 May, he was flying alone near the Belgian town of Waremme when he spotted a Squadron of 12 German Messerschmitt 109s, which at the time was the most advanced fighter in the German Luftwaffe. Undoubtedly using his aerial acrobatic skills to their fullest, he climbed high, and then swooped down on the formation. Catching the Germans by surprise, he shot down one of the 109s, before quickly escaping the wrath of the remaining nine. On May 15, he attacked a formation of eight 109s, again shooting down one of them. He engaged the Luftwaffe on every day of the German invasion, and may well have downed more aircraft than he is officially credited for. With the Belgian Army facing defeat on the 19th of May, Charles' squadron flew to France to continue the war with the French Air Force. On June 3, he attacked a formation of twelve German bombers near the town of Chartres. Although he did not shoot it down, he is credited with damaging one of the bombers badly enough that it would never fly again. He was still flying his biplane. Since Belgium was occupied by the Nazis, crossing directly from Belgium to England was impossible. So, Charles headed south with the intention of crossing France and Spain and joining up with the British in Gibraltar. Travelling completely on his own and without any assistance, he made it on foot all the way across France and across the Pyrenees mountains. However, somewhere in Spain he was spotted and arrested by Generalissimo Francisco Franco's fascist forces. They imprisoned him as an illegal alien in the Spanish camp of Miranda de Ebro near Burgos. The sanitary conditions in that camp were notorious for being no better than the concentration camps that the Nazis were running in Germany. While there, Charles contracted an eye disease that nearly made him blind in his left eye. However, in May of 1942, he found a way to escape again. This time, he made it Gibraltar. From there, the British Navy transported him to England. Charles' first stop in England was to see the Belgian Air Attaché in London, who vouched for his background and introduced him to the recruiters of the Royal Air Force. However, the RAF's medical examiners rejected Charles for service because of his now bad left eye. Charles was heartbroken by this decision, and he asked the Belgian authorities in London to help him. Major Kronacker, Belgian Air Attaché to the United States Army Air Forces (USAAF) in London, arranged a deal for him. If Charles would accept entering the USAAF as an enlisted man, the eye examination would not be necessary, and he could at least serve. Eager to get back into the war, Charles accepted the deal, even though it meant a significant demotion in rank. On 8 January 1943, Charles officially enlisted as a Staff Sergeant in the USAAF, with his State of Residence listed as "U.S. At Large." He was assigned to the 6th Fighter Wing Headquarters of the 8th Fighter Command. The question was, what would the Americans now do with him? For three months, Charles flew a desk at Headquarters. His job was to help plan the tactics for the American bombing missions into Germany, as well as Nazi occupied Belgium and France. From Charles' education and upbringing, it is clear that he was brilliant, excelled in mathematics, and understood the geography of occupied Europe. He must have used these skills to their maximum advantage. Charles' work impressed the senior commanders of the USAAF in London. They also knew that he had been an officer and a pilot in the Belgian Air Force. They were aware of his distinguished flying record in Belgium. So, they offered him a position of much greater responsibility within the 8th Air Force Headquarters, and, according to one source, a promotion to the rank of Colonel. Charles refused, saying, "I came here to fight for my country, not to sit behind a desk." Rejecting that kind of promotion was a highly unusual decision. So, his superiors decided to see how serious Charles was about the decision. They took him out to an airstrip, put him in the cockpit of an Auster training aircraft, and told him to show them what he could do. Charles must have put on quite a show, and Charles himself later said to a family friend that his performance was one of the finest moments of his life. He was soon promoted to a First Lieutenant in the USAAF, with serial number 02044526. Charles had the rather unique distinction of earning his wings twice, once for the Belgians and once for the Americans. Charles was then assigned to 14th Photo Squadron of the 7th Reconnaissance Group. Although Charles told the same family friend that he would have preferred to fly fighters, he gladly accepted this assignment. It put him back in the air and back in action. Although the bombers and the fighters got all the credit, the reality was that the reconnaissance units were arguably more important. Without knowing where the enemy positions were or their strength, commanders could not take competent decisions about where to send the Allied Armies or where to send bombers to strike. It was not a fighting role, but it was a role that was critical for the war effort. Moreover, it was dangerous. While taking their photos and mapping enemy positions, the reconnaissance pilots were vulnerable to attack by enemy fighters and anti-aircraft flak. That is one of the reasons why the 14th Photo Squadron also flew aircraft that were unique for the USAAF. Although the unit was American and the pilots were all USAAF officers, they flew the British Spitfire XI aircraft. Its performance in achieving altitude and speed were considered superior for that line of work than the American aircraft that were available. Charles nicknamed his Spitfire "Kisty." For accomplishing with merit and distinction a large number of aerial photographic reconnaissance missions over occupied Europe. In despite of great danger of interception by enemy fighters and anti-aircraft fire, he overcame all obstacles and took excellent photographs of the assigned objectives. His courage, determination and skill as a pilot are proof of his honor and service to the Armed Forces of the United States. On 8 September 1944, Charles was flying a mission to map the Siegfried Line near Saarbrucken in Germany. While returning to England, his plane was hit by anti-aircraft fire near Reckange-les-Mersch in Luxembourg. It burst into flames and crashed to the ground at a place called Beseneberg near the village of Reckange. It burnt on the ground for another two or three hours. When the fire had subsided the local parish priest and a few local citizens approached the wreckage. The charred remains of Charles were unrecognizable. However, they could distinctly make out his plane's identification plaque, which identified him as Charles Goffin of the 14th Photo Squadron. They buried him in the cemetery of the village. Two days later, the American Army liberated the village. 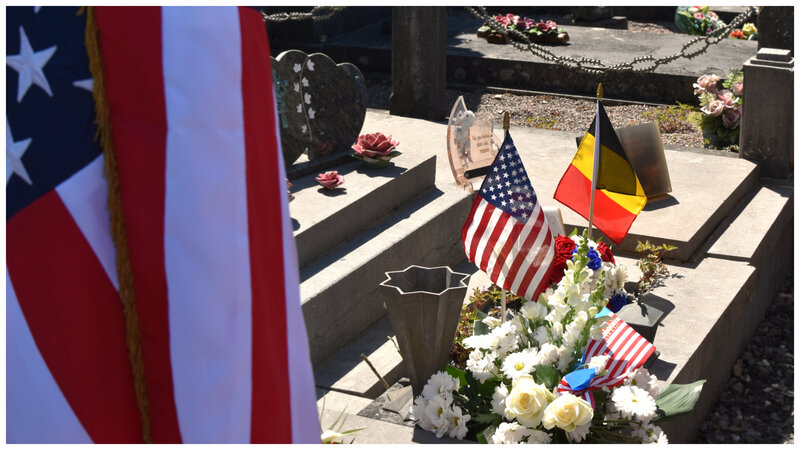 In March 1946, the American Graves Registration Service removed Charles from the village cemetery, and took him to the Luxembourg American Cemetery in Hamm. They notified Charles' family and asked them if they wanted his body to remain in that cemetery, or to be brought home. The family asked that Charles be returned to his hometown of Graide. Early in the morning of 11 September 1946, Charles returned to Graide. His casket was brought into the Goffin's family home for visitors to pay their respects. Major Leboutte of the Belgian Air Force arrived to bestow upon Charles two posthumous honors, which he placed on the casket: the Cross of the Order of Leopold with palm, and the Belgian Cross of War (Croix de la Guerre) with palm. Charles was then brought to the local church for a funeral mass, and to the cemetery in Graide for burial in the family tomb. 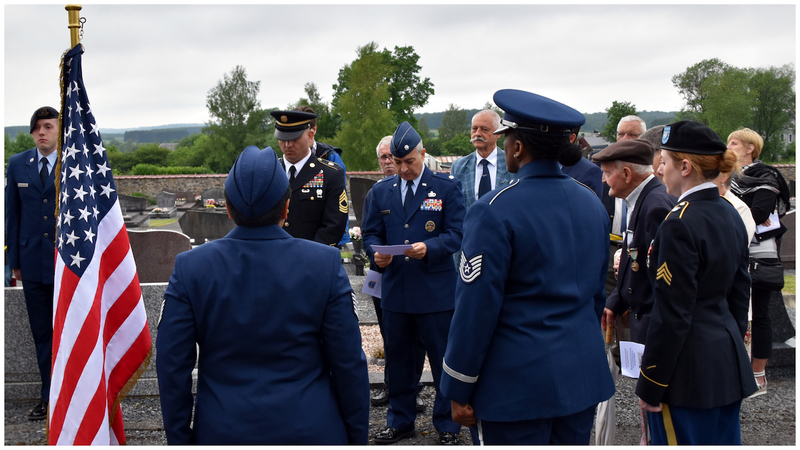 In attendance were the Mayor and other officials of Graide, representatives of the Belgian military, several veterans organizations, the delegation of American soldiers that brought Charles' body home, and even a group of representatives from the village of Reckange in Luxembourg. Children from the local school sang a tribute to Charles at the grave. Just before the casket was lowered into the grave, the American soldiers folded the American flag that draped Charles' casket, and presented it to his mother. In the years following the war, some of the Americans who had served with Charles came to Graide to meet his mother and visit his grave. Two undated and unattributed monographs in French that were clearly written by people with knowledge of the story. However, there are contradictions between these two accounts, particularly related to the circumstances under which Charles entered the USAAF. In recounting the story above, the author selectively pulled the facts from both versions, based upon his own knowledge of the USAAF and how well those facts accorded with other sources. An article in French by George Destrebec... (name incomplete) that appeared in a publication that appears to be called Aero Mag in its April/May 1983 edition.